Only one cable of the pair is shown at the picture below. The additives to the alloy (silver and molybdenum) allow us to achieve the correct tonality which we feel would be impossible to offer using just plain copper. 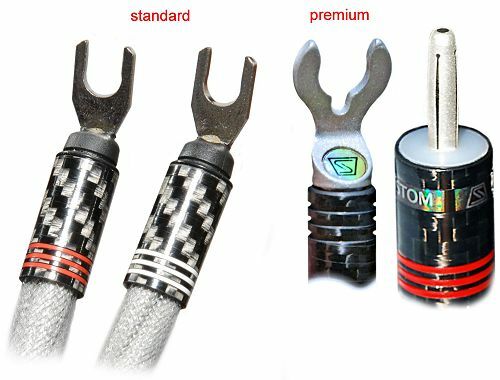 Standard termination: Cardas copper spade lugs (Rhodium-over-silver plated) in STEALTH carbon fibers shells. The Reverie offers well balanced overall presentation: good low bass and treble extension, good resolution and neutrality. The Reverie is designed to offer the highest price-to-performance ratio among the STEALTH loudspeaker cables. $2,300 for a 1.5 meters or shorter pair; bi-wiring with the standard termination adds $450; tri-wire adds $600. $2,700 for a 1.5 meters or shorter pair; bi-wiring with the PREMIUM termination adds $650; tri-wire adds $1000.